We went to a little antiques fair on Hanover Street today, and came across the perfect engagement ring. It's small and blue, and it fit perfectly without any adjustment. Em wore it out of the fair. 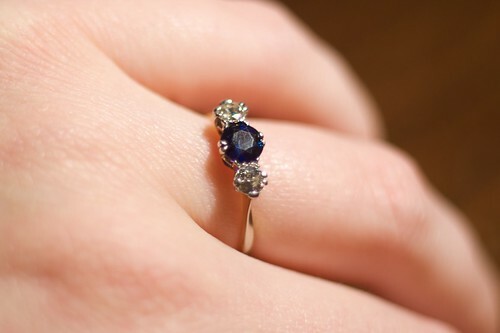 About the ring: It's an Edwardian (circa 1910) sapphire and diamond three-stone ring, set in platinum (around the stones) and yellow gold (the band). We're told that was common for the period - they had moved from the all-gold rings of the Victorian era, but still could not work platinum well enough to make the entire ring from it. wow ... what a stunning ring! gorgeous gorgeous gorgeous!